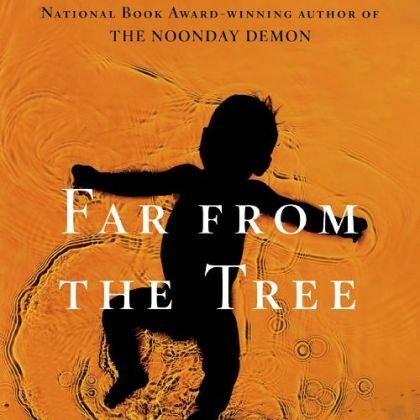 For the past few weeks, I have been reading the most interesting book: Far From the Tree: Parents, Children, and the Search for Identity, by Andrew Solomon. We talked about it today in the Introduction to Systematics course, where we had a great discussion regarding about issues of Christian anthropology, so I decided to mention it here, as well. As the title of the book suggests, Solomon researches the challenges around identity formation in children whose identity is different in a substantive way from that of their parents [apples who have fallen “far from the tree”–get it?]. He himself is a gay man, and so he begins the book using his own story as an example; subsequent chapters discuss deafness, dwarfism, autism, and schizophrenia, to name a few. [I’m not finished yet, so I haven’t read them all]. Part of what he wants to challenge is what he calls the “false dichotomy” of illness vs. identity: for example, is “gayness” an “illness” to be fixed, or an “identity” to embrace? Obviously, Solomon himself would say the latter–but he notes that if there had been a surgery that would have “fixed” him when he was young, he’s sure his parents would have elected for him to have it, in the [misguided] belief that it would have made him happier. Solomon understands this, because he also admits that before he began studying the Deaf community, he knows he probably would have chosen cochlear implants for his [hypothetical] child on the same grounds–even though after spending time with that community, he came to see how those implants are viewed as almost genocidal, fixing a “illness” that is actually an identity to be embraced. Yet, this is not to say that every disability should be embraced, and that nothing should be done to alleviate physical and/or mental suffering–given that we have the technology in many cases to do so. [For example, Solomon himself suffers from depression, while he has come to terms with it as part of who he is, he also would not be sorry to be rid of it, and would not wish it on his own children.] Solomon writes, “at the far end of the disability spectrum is a zone that corresponds to poverty, a place of severe privation, where rhetoric cannot make things better. The disability poverty line varies from one community to another, but it does exist. To deny the medical realities such people negotiate is equivalent to denying the financial realities of the slum child. The body and the mind can be agonizingly broken. Many disabled people experience debilitating pain, struggle with intellectual incapacities, and live in permanent proximity to death.” However, the challenge, of course, is who gets to decide what needs to be “fixed”–especially when many parents make these decisions for their children before the children are old enough to decide for themselves: cochlear implants, limb-lengthening surgery, medication, etc., etc. [To say nothing about decisions to abort based on a particular diagnosis of the fetus…..] Navigating these waters is not easy. But the whole point of the whole book, really, is to tell the stories of those parents and children who were able to “learn happiness” in the midst of the identity/illness dichotomy, such that we all might be enriched by a broader, expanded definition of the human family. And this is the point where theology can engage so powerfully, I think, with the message that every, single individual is created in the image of God, and that uniqueness is part of our created giftedness. The Christian community can and should be a place where differences are celebrated, whole families are welcomed, nurtured and supported, and wholeness for all is lived out together. We don’t always embody this reality, sadly. Many of the parents Solomon interviews finally come through the suffering [while never leaving it fully behind] to a place of deep love and richness, a place treasured and precious: “This book’s conundrum is that most of the families described here have ended up grateful for experiences they would have done anything to avoid.” He quotes Rumi, who says “the light enters you at the bandaged place”–and, surely, that’s an affirmation the Christian church can make as well. The Solomon book is waiting on my “to read” list on my iPad. How lovely to lift these issues up in a discussion of theological anthropology! For whatever it's worth, my vote is a tie between Christmas and Easter. Weirdly (or maybe not so weird), I still find that incarnation is easier to preach than resurrection.